When I reviewed the first season of Noragami a few years back, I had mixed feelings about it. However, that was only because I felt it could be great once it got past its opening missteps. Noragami Aragoto was all I hoped for and more. Much of Aragoto is spent focusing on the god Bishamon. In the first season of Noragami, Bishamon was a looming antagonist connected to Yato through a secret past. In Aragoto, all is laid bare. In fact, in the first of Aragoto’s two arcs, Bishamon gets as much screen time as any of our three returning leads. Bishamon is the Japanese version of a Buddhist deity (Vaiśravaṇa). She is incredibly well known and is a part of Japanese mainstream culture. So while through Yato we are able to see what life is like for a god on the edge of being forgotten, through Bishamon, we get a good look at what it’s like at the top. She serves as the gateway to expanding the world of Noragami. Through her we learn much more about the society of gods as a whole, how they interact, and even get hints about how she is viewed as a powerful, yet foreign-born god. When it comes down to it, the first half of Aragato is largely a Bishamon character piece. Just because she doesn’t face the same problems as Yato, that doesn’t mean she doesn’t have problems of her own. While Yato has only one “regalia” (a human spirit that can turn into a weapon) in the form of Yukine, Bishamon has hundreds. She rescues any human souls she encounters, regardless of their usefulness and brings them into her household. But as we learned in the first season, there is more than a little danger inherent in this situation. Basically, all gods are linked to their regalia. Any impure thoughts or actions on the part of a regalia painfully corrupts their god—and eventually said corruption can become lethal. This has created a system destined to fail. While coming from a place of caring, Bishamon has created a group of people that have to be happy and pure all the time. Yet Bishamon uses so few of her regalia, most feel like freeloaders—a negative emotion which can in turn harm Bishamon. Doing this, they feel even worse as they are actively harming the person who saved them from being wandering spirits—and so the spiral continues. And of course no one informs Bishamon of any of these problems, for fear of causing her more distress—and thus leave her open to attack from any who know how to exploit the flaw. Ultimately, Yato is just a pawn in the story of Bishamon’s destruction. His concerns remain largely the same as always as he continues to do odd jobs for five yen a pop—until Hiyori gets dragged into Bishamon’s story, anyway. After the growing pains of the first season and its mind-wiping shenanigans, Yato, Hiyori, and Yukine have entered into a stable, deep friendship. Much of the trio’s arc for the series is based on how each views the friendship. For Yato, it is simply the most important thing in his eternal life—and the fear of losing it rules his actions. His working to overcome this insecurity and move on to a new chapter in his life serves as the main plot of the second half of the anime. Yukine, on the other hand, wants to find meaning in his afterlife by being the best regalia he can be—taking lessons from both Hiyori (to become a more intelligent person) and one of Bishamon’s own regalia (to become a more powerful regalia). Hiyori believes almost too strongly in the permanence of their friendship—and her arrogance leads her to almost lose it entirely without even knowing what she lost or why. Together, the three characters’ arcs make for good personal drama that never feels cheap. And by the end, all three have changed for the better because of it. As with the first season, Hiyori remains the most captivating character in the anime. From her point of view, she is a normal girl that is best friends with several people who happen to be gods. But from an outside, more objective view, her role is endlessly interesting. Hiyori talks to gods. But we already have a word for that: prayer. The difference between Hiyori and others is not only does she know the gods are listening but they answer her as well. Moreover, she has been to heaven and—in the case of Yato—has a god willing to do anything she asks. From a traditional viewpoint, Hiyori is, for all rights and purposes, a high priestess—and a damned powerful one at that. It’s one thing to hope the gods are listening and quite another to be able to command them. By the end of the series, she shows such a connection with certain gods that she is able to summon them to her side instantly—with said gods having no ability to disobey. The main overarching theme in Aragoto is one of reincarnation. While lesser gods like Yato will likely disappear when killed, gods like Bishamon or Ebisu (the god of fortune) will be reincarnated upon death. The belief in them is so strong that a new child god of the same name is reborn instantly—though without the memories. In Aragoto we see these two different gods struggling with what it means to reincarnate. For Bishamon, losing all her memories, tragic or otherwise, is the same as death. Ebisu, on the other hand, believes there is nothing special about his current incarnation or any other incarnation of himself. He is willing to exploit his immortality to further his goals—though to gods like Yato this seems like the worst possible way to view oneself and one’s life. All in all, the philosophical debate about reincarnation makes for an enjoyable capstone to the series. 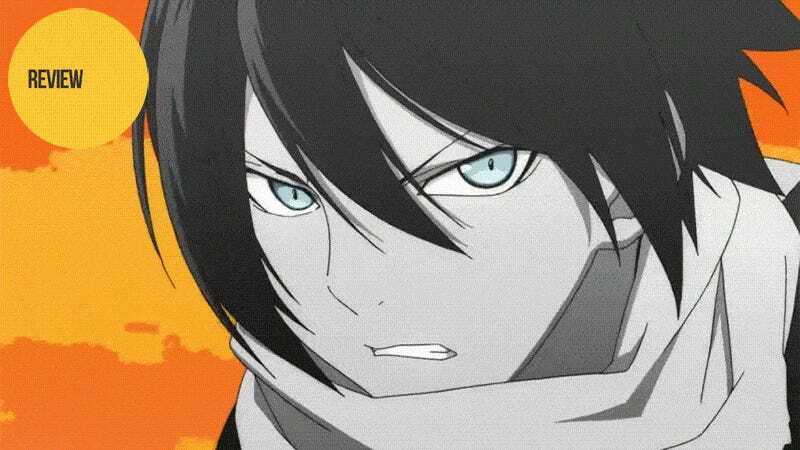 Noragami Aragoto is all that I want in an adventure/fighting anime. It has deep, dynamic characters, a complex world filled with a mixture of real world and fictional religious lore, and a multi-layered story that is easy to get lost in. So while the series ends at a good stopping point, I for one will be eternally dissatisfied if the trio’s animated adventures end here. Noragami Aragoto aired on Tokyo MX in Japan. It can be viewed for free and with English subtitles in the US on Funimation and Hulu (and on Animelab in AU/NZ).